Contents. List of Contributors. 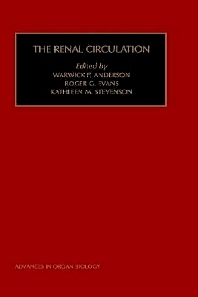 Introduction: Significance of the Renal Circulation (W.P. Anderson, r.G. Evans, and K.M. Stevenson). Structure of the Renal Circulation (J.F. Bertram). Development of the Renal Vasculature (D. Alcom). Cell Physiology of Vascular Smooth Muscle Cells and Mesangial Cells and the Impact of this on the Control of Renal Circulation (G. Wolf). Control of Afferent and Efferent Arteriolar Tone (S. Ito). The Intrarenal Distribution of Blood Flow (T.L. Pallone, A. Edwards, and M.S. Kreisberg). Blood flow in the Glomerular Capillary Network (K.M. Denton). Autoregulation (H.R. Kircheim and A. Just). Tubuloglomerular Feedback (J. Schnermann). Neural Control of the Renal Circulation (G.F. DiBona and U.C. Kopp). Endocrine Control of Renal Vasculature (J.G. McDougall, R. DeMatten, C.N. May and N.A. Yates). Endothelial Factors in the Regulation of the Renal Circulation: Nitric Oxide (W.H. Beierwalles). Angiotensin II Regulation of the Renal Circulation (P.K. Carmines). Endothelin and the Kidney (P. Nambi). Nonendothelial Paracrine Regulation of the Renal Micro circulation (E.W. Inch, J.D. Mig, and L.G. Navar). Integrative Aspects of the Renal Medullary Circulation (G. Bergstrom and R.G. Evans). Aging and the Renal Circulation (Z. Greenfeld and C. Baylis). Fetal Renal Circulation (E.R. Lumbers). The Renal Circulation in Pregnancy (E.R. Lumbers). Renal Circulation in Genetic Experimental Hypertension (A. Bataillard, M. Lo, and J. Sassard). Remodeling of the Renal Resistance Vessels in Hypertension (K. Skov and M.J. Mulvany). Renal Blood Flow in Human Diseases (J.J. Kelly and J.A. Whitworth). Renal Hemodynamics in Human Hypertension (P. van Paassen, D. de Zeeuw, P.E. de Jong, and G. Navis). Obesity, Insulin Resistance, and the Renal Circulation (J.E. Hall, M.W. Brands, E.W. Shek, and J.R. Henegar). Index.